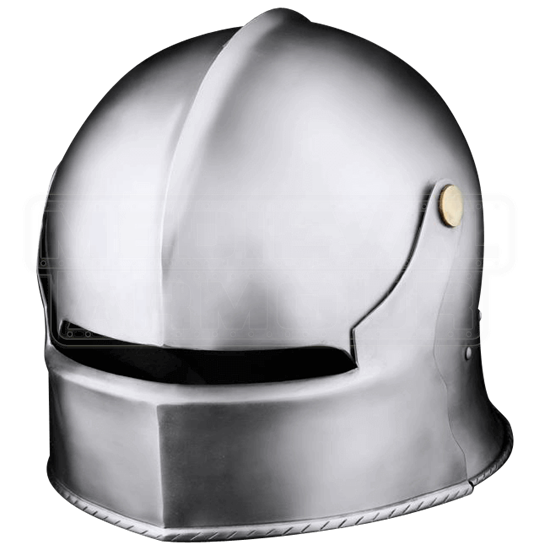 Keep your head safe during battle with the Swiss Sallet. This version of the historic helmet, handcrafted in 16 gauge steel, features a hinged bevor that leaves a narrow horizontal strip exposed at the front for sight when lowered. The rounded head of the helm features a ridge at its center. Modeled after helmets of the 15th and 16th century, the Swiss Sallet is elegant in its simplicity and will serve its wearer well during reenactment events. I love this helmet!!! The detailing is exquisite. On the back of the helmet there is a small maker's seal which is pretty cool. And there is even a mount for a plume on the back of the helmet as well. I put a couple of ostrich feathers on the helmet through the mount, and it looks awesome with the feathers. The visor locks in really nice with the side pin, which is located on the right side of the helmet. And it's also really easy to release the visor and the pin. Very solid construction. It also comes with a thick chin strap, and internal padding. Which is nice, because it's ready to go out of the box. However the padding that it comes with is not historical, it's just long strips of thin foam forming a cross with canvas covering it. and there are rivets running along the whole length of the helmet which historically would've been for attaching a internal liner. However in this case they're meant more for looks. Those rivets can scratch things up on the inside of your head. I wear an arming cap with this helmet, and it's getting torn up by those rivets on the inside of the helmet. I would recommend removing the internal padding that it comes with and replace it with an adjustable liner. That would work much better for the helmet, especially for combat.